its effects on skeletal muscle, the liver, the action of T3 and more. into key literature on these metabolic relationships. polycystic ovaries and hypothyroidism–the hair loss, the weight gain, etc. “the pivotal regulatory role of T3 in major metabolic pathways”. (treating subclinical hypoT (T3/T4 euthyroid) with natural dessicated thyroid (NDT). T3 is jump-starting the metabolism by re-activating AMPK. pedal, all it does is flatten the battery and flood the engine. might not have had their AMPK pathways altered and the T4-T3 conversion still works. logically be given to ward off a greater problem down the line. Metformin research should branch out to also look at thyroid disease. just like Metformin does for insulin resistance. according to a study in CMAJ (Canadian Medical Association Journal). by reducing glucose production in the liver. metformin may lower thyroid-stimulating hormone levels. 59 937 had normal thyroid function. metformin may lower thyroid-stimulating hormone (TSH) levels. in patients with type 2 diabetes mellitus. between Jan. 1, 1988, and Dec. 31, 2012.
followed them until Mar. 31, 2013. 495 events of low TSH levels were observed (incidence rate 0.1197/person-years). No association was observed in euthyroid patients (adjusted HR 0.97, 95% CI 0.69–1.36). Interpretation: The clinical consequences of this needs further investigation. is an enzyme that plays a role in cellular energy homeostasis. together make a functional enzyme, conserved from yeast to humans. modulation of insulin secretion by pancreatic beta-cells. subunits takes on a specific role in both the stability and activity of AMPK. giving AMPK its ability to sensitively detect shifts in the AMP:ATP ratio. increases the binding affinity of the second AMP to the other Bateman domain. change which exposes the catalytic domain found on the α subunit. (AMPKK). The α, β, and γ subunits can also be found in different isoforms. place during rest and exercise (muscle stimulation). brought about by an extreme cellular demand for ATP. the mice ate less and lost weight. the mice ate more and gained weight. reduced insulin resistance in the muscle. Triggering the activation of AMPK can be carried out provided two conditions are met. expose the active site(Thr-172) on the α subunit. under increased concentrations of AMP. as two AMP bind the two Bateman domains located on that subunit. of AMP that exposes the active site (Thr-172) on the α subunit. brought about by an upstream kinase (AMPKK). and a worse substrate for phosphatases. As muscles contract, ATP is hydrolyzed, forming ADP. forming an ATP and an AMP. but it was not the main AMPKK in liver. ribofuranoside (AICAR) phosphorylation and activation of AMPK. an AMP analogthat has been shown to activate AMPK. LKB1-STRAD-MO25 is the major AMPKK in muscle. the upregulation of fatty acid oxidation. Adiponectin also stimulates the uptake of glucose in skeletal muscle. and hexokinase II are thought to be mediated in part by AMPK when it is activated. during single bouts of exercise and long-term training. phosphorylation and inactivation of acetyl-CoA carboxylase. (MCA), an inhibitor of carnitine palmitoyltransferase 1 (CPT-1). CPT-1 transports fatty acids into the mitochondria for oxidation. Inactivation of ACC results in increased fatty acid transport and oxidation. This resultsin decreased malonyl-CoA and increased CPT-1 and fatty acid oxidation. known that hepatic ACC has been regulated in the liver. which then travels down several more metabolic steps to become cholesterol. glucose to be transported into the cell. also an increase in phospho-ACC, a marker of AMPK activity. (1 Pt 1): E1–10. PMID 10409121.
during exercise”. J. Physiol. 270 (2 Pt 1): E299–304. PMID 8779952. Durante PE, Mustard KJ, Park SH, Winder WW, Hardie DG (July 2002). protein kinase isoforms in rat muscles”. Am. J. Physiol. Endocrinol. and deactivation of AMP-activated protein kinase”. J. Biol. Chem. Leonidas H. Duntas, Jacques Orgiazzi, Georg Brabant Clin Endocrinol. 2011;75(1):1-9.
inhibiting activity of the enzyme. counteractT3 effects at the hypothalamic level. in the hypothalamic partitioning of energy homeostasis. levels in the pituitary gland are substantially increased. administered alone and up to 55% when it was added to ongoing LT4 treatment. independent of T4 treatment and does not alter the TH profile. particularly with suggestive symptoms, raised antibody titres or dylipidaemia. their effects on the central nervous system (CNS) contribute to global energy balance. upregulates thermogenic markers in brown adipose tissue (BAT). hormone receptors in the VMH reverses the weight loss associated with hyperthyroidism. a mediator between dietary and endogenous sources of energy for extrahepatic tissues. catabolism, thus increasing ATP availability. downstream signaling under several experimental conditions. affording preconditioning against ischemia-reperfusion (IR) liver injury. which are required to cope with the damaging processes set in by IR. the brain and erythrocytes, under cycling conditions between fed and fasted states. glycogen or channelled into de novo lipogenesis. stimulated glycogenolysis and gluconeogenesis (from alanine, lactate, and glycerol). alterations in liver functioning affect whole-body metabolism and energy homeostasis. by stimulating catabolic processes, to increase ATP production. two regulatory subunits β and γ .
domain, with the C-terminal region being required for association with β and γ subunits. bind AMP or ATP in a competitive manner. of Thr172, probably by protein phosphatase-2C. kinase in hepatic Toll-like receptor 4 signaling in response to lipopolysaccharide. the liver to respond to small changes in energy status in a highly sensitive fashion. long-term effects of AMPK activation induce changes in hepatic gene expression. to be phosphorylated by activated AMPK. through AMPK activation by upstream LKB1. bind to thyroid hormone response elements (TRE) to activate gene expression. 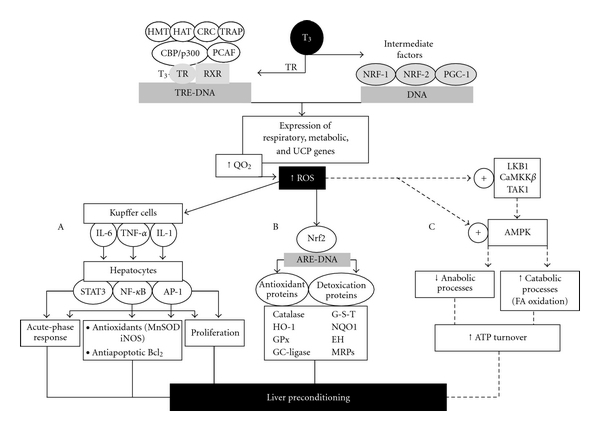 some anabolic processes via upregulation of genomic mechanisms. stimulation of ATP synthesis and consumption. induced by both T3 and peroxisome proliferator-activated receptor α (PPAR-α). augments T3 induction of CPT-Iα expression. with the onset of mitochondrial biogenesis and fatty acid β-oxidation. protecting the liver against ischemia-reperfusion injury. consumption, reactive oxygen species (ROS) generation, and antioxidant depletion in the liver. of O2 consumption; SOD, superoxide dismutase. 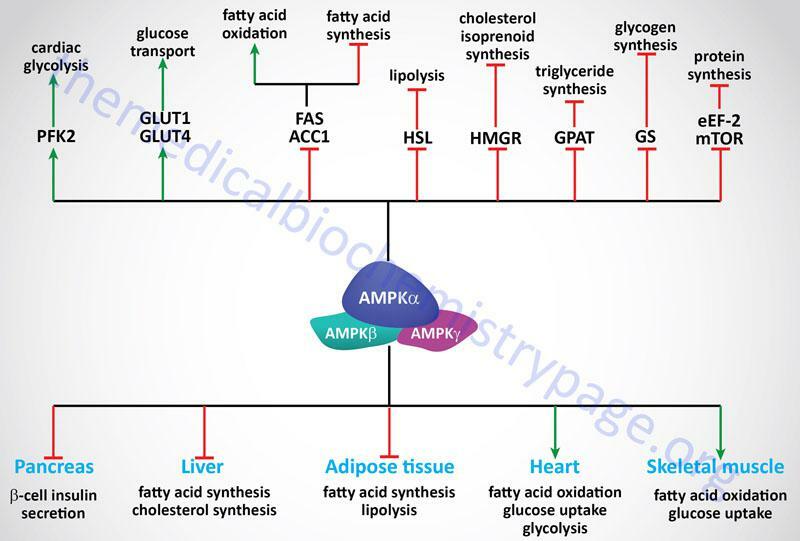 (C) activation of the AMPK cascade regulating metabolic functions. (- - - -), proposed mechanisms. affording liver preconditioning (Figure 3). (iv) stimulation of mitochondrial fatty acid β-oxidation. important gene regulatory functions of AMPK in skeletal muscle. in fatty acid oxidation proportional to enhanced cardiac mass and contractile function. to rats activates liver AMPK (Figure 4; unpublished work). supporting hepatoprotection against IR injury (Figure 3(C)). mechanisms that are needed to cope with the damaging processes set in by IR. constitutes protective strategies against hepatic IR injury. activation (Figure 4) are currently under assessment in our laboratory. Transduction Therapy 2009; 4(2): 144–151. for energy control,” Trends in Biochemical Sciences, 2004;. 29(1): 18–24. Journal of Biological Chemistry 1996;271(17): 10282–10290. activated protein kinase,” Nature 2007; 449(7161): 496–500. Impact of Metformin and compound C on NIS expression and iodine uptake in vitro and in vivo: a role for CRE in AMPK modulation of thyroid function. Abdulrahman RM1, Boon MR, Sips HC, Guigas B, Rensen PC, Smit JW, Hovens GC. recently been reported, and much of its function in the thyroid is currently unknown. to investigate the mechanism of AMPK modulation in iodide uptake. CRE activation (0.6- and 3.0-fold). knockout mice to determine the long-term effects of AMPK inhibition without chemical compounds. can be modulated by metformin and compound C.
the activation of the CRE element in the NIS promoter. treatment of thyroid cancer patients with radioactive iodine. enzyme at a central control point in maintaining energy homeostasis. 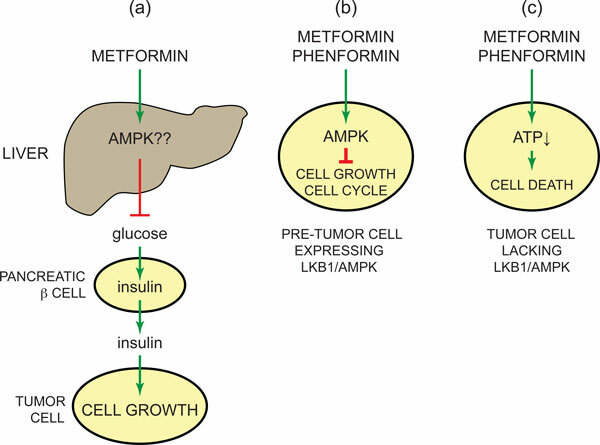 More recent evidence has shown that AMPK activity can also be regulated by physiological stimuli, independent of the energy charge of the cell, including hormones and nutrients. biosynthesis) to active ATP production (e.g. fatty acid and glucose oxidation). long-term effects at the level of both gene expression and protein synthesis. modulation of hypothalamic functions involved in the regulation of satiety. How these latter two functions impact obesity and diabetes will be discussed below. In the presence of AMP the activity of AMPK is increased approximately 5-fold. leading to increased phosphorylation and decreased dephosphorylation of AMPK. phosphorylated by at least three different upstream AMPK kinases (AMPKKs). lies in the activation loop. which phosphorylates and activates AMPK in response to increased calcium. provides a mechanism for cells to anticipate the increased demand for ATP. tumor suppressor gene, is required for activation of AMPK in response to stress. 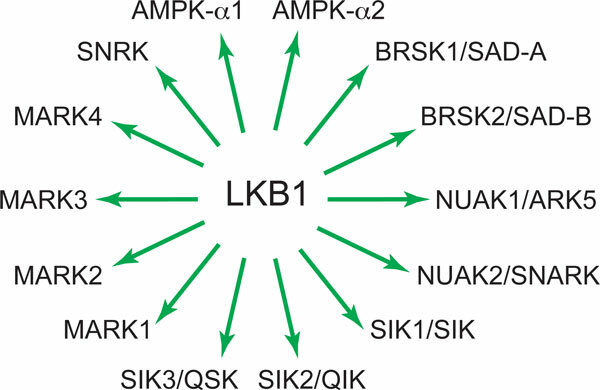 LKB1 is widely expressed, thus making it the primary AMPK-regulating kinase. phosphorylates AMPK are currently unclear. AMPK is highly sensitive to small changes in the intracellular [ATP]/[ADP] ratio. by placing AMPK in close proximity to one of its substrates glycogen synthase. hormones secreted by adipose tissue (termed adipokines) such as leptinand adiponectin (discussed below). muscle, heart, adipose tissue, and pancreas. the resultant inhibitory effects of AMPK action. individuals with type 2 diabetes. transporters also occurs in skeletal muscle in response to contraction (exercise). than that stimulated by insulin and insulin and AMPK effects are additive. of the gluconeogenic enzyme fructose-1,6-bisphosphatase (F1,-6BPase). phosphorylation sites found in the cardiac and inducible (iPFK2) isoforms of PFK-2. recognized as the Pasteur effect: an increased rate of glycolysis in response to hypoxia. additional regulators of its activity have been identified. through regulation of the activity of AMPK. requires the activity of LKB1 in the liver for this function. phosphorylation of endothelial nitric oxide synthase, eNOSin cardiac endothelium. NO production and provides a link between metabolic stresses and cardiac function. due to its phosphorylation by AMPK. limiting the pro-coagulant effects of platelet activation. a member of the steroid/thyroid hormone superfamily. pancreatic β-cell genes such as GLUT2, L-PK and preproinsulin. maturity-onset diabetes of the young, MODY-1. metabolism in liver, in particular in response to glucose uptake. itself may be a target for the action of AMPK. expression of gluconeogenic enzymes in this tissue.